There are hundreds of things that we think about every single day, so there is going to be small stuff that slips our minds. We may forget about the trash or to pass in assignments. Forgetfulness could also be risking your health. Leaving a tampon in for too long can cause Toxic Shock Syndrome. Toxic Shock Syndrome was very well known in the 1980’s and 1990’s, because of the media and warnings in tampons. However, it is still a risk today. In 2016, Emily Pankurst left a tampon in for 9 days. She was stressed about exams and forgot to change her tampon. She nearly died, but she survived, thanks to serious medical care. However, she is not the only one who has faced the risk of Toxic Shock Syndrome. Each year, around 1 in 100,000 women between 15 and 44 years of age report a case of Toxic Shock Syndrome associated with using a tampon. Men are also at risk. Toxic Shock Syndrome is not only caused by tampon use, it is just more common with tampon use. Jim Henson, the creator of the Muppets is one of the men who has died from TSS. TSS is caused by foreign objects in our bodies and the bacteria that can be on them. Our white blood cells try killing the bacteria, but when the bacteria builds up, the blood cells will start attacking itself in confusion. This can be an embarrassing question to ask because there are warnings about TSS in every tampon instruction pamphlet and other period items. Most people think that it is a horrible disease that women get from tampons. However, TSS is not a disease on its own. TSS is a complication of a bacterial infection where the white blood cells try to kill off the bacteria, but the streptococcus can produce a toxin named Toxic Shock Syndrome Toxin 1 or TSST-1. TSST-1 causes the white blood cells to go into shock and the infection spreads. A fever starts and quickly rises as the body tries to kill the infection with heat. If left untreated, the infection and TSST-1 can cause multi-organ failure. There is the risk of the infection entering the bloodstream, even if the bacteria starts in an isolated area. This can happen due to the micro scratches that can be caused by tampons. There are other causes of TSS, but TSST-1 is the most common cause of tampon-related cases. There are mixed studies about if all cotton, organic tampons can reduce the risk of TSS. Many tampons are perfumed and are designed to be highly absorbent. However, these tampons can irritate and leave you more vulnerable to bacteria growth. A 1994 study found that all cotton tampons do not produce TSST-1, but the tests have never been able to give clear results. There was also a 1995 study that cotton-rayon tampons were no more dangerous in terms of TSST-1 than pure cotton options. Menstrual cups are another period care product that you can pick. Like any other period care product on the market, there is still the risk of Toxic Shock Syndrome if you leave it in, or if it is not clean. When properly used and cleaned, there is a very small risk of Toxic Shock Syndrome. Some women find them more comfortable and easier to remember to remove and clean than a tampon. Organic tampons can be a better option because they are better for the environment. No matter, your choice of tampon, you should be changing them regularly. 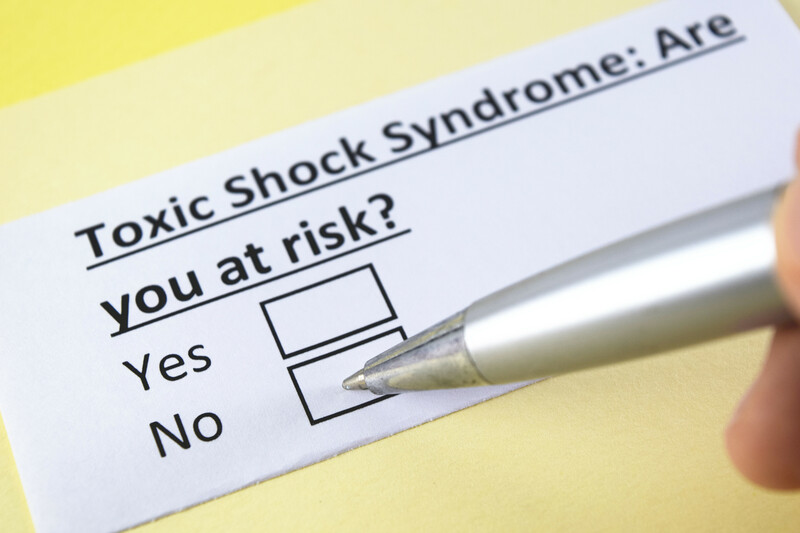 How to Reduce the Rick of Toxic Shock Syndrome? Reducing your risk of Toxic Shock Syndrome is easy. The best way to do this is to change your tampon regularly, basically every 4 to 8 hours. It is really rare to see someone develop TSS from having a tampon in for 12 hours, but it is still better to change it regularly. Plus, a dry tampon hurts when you take it out. Another way of reducing your risk is to not use higher absorbency tampons than what you need. The more absorbent a tampon is, the longer you may think that you can go without changing it. Instead, use the lowest absorbency that you can use. Many doctors recommend that you do not wear tampons overnight. The amount of time that you have a tampon in increases the risk of TSS. There is also the morning rush, which makes it easy to forget to change or remove your tampon. So, your best solution is to not use tampons overnight when you can. Reducing the number of days you use tampons can help reduce the risk of TSS. It is best to just use tampons on your heavier days and when you are working out. The less you use tampons, the lower the risk of TSS. Changing pads regularly is also important. If you are wearing a pad and a tampon, you should change the pad when changing the tampon. The pad could have bacteria on it, and inserting a new tampon with an old pad can increase the risk of TSS. Good hygiene is super important when you have on your period because there is a lot of bacteria around that area. It is recommended that you wash your hands before and after inserting a tampon. If you cannot wash your hands, using a hand sanitizer can reduce the bacteria that is on your hands. An unscented hand sanitizer is recommended since perfumes can harsh on the skin. It is also important to have regular washes and/or showers during your period to fight bacteria. A daily wash can cut down on the amount of bacteria that has a chance to grow. TSS tends to have a sudden onset of symptoms with a high fever that seems to come out of nowhere. If you get ill quickly after using a tampon, you should see a doctor as soon as possible. Most of the early symptoms of TSS look a lot like the flu, but there are some symptoms that really stand out. There is usually a rash that resembles a sunburn, even with the heat and peeling skin that sunburns have. More severe symptoms can include headaches, vomiting, diarrhea, and confusion. If you start having any symptoms of TSS after using a tampon, you should seek medical attention right away. It could be the flu or it could be TSS, so it is not worth the risk to not have it checked out. The infection can cause massive inflammation inside the body, which can rapidly cause organ damage or even death. Antibodies have saved many people who have had TSS, but it is better to catch it early. TSS has been on the decline for decades. However, there is still the risk of TSS happening. The amount of stress teens are under, and the number of things that they need to do in a day can make it easy to forget to change or remove a tampon. The amount of time that you can wear a tampon depends on your body, but it is recommended to change your tampon regularly. Even pads have a risk of causing TSS if they are worn too long.